Americans don’t traditionally consider everyday foods as medicine. But maybe we should take a few clues from Asian and Mediterranean societies that eat this cool food at the height of the hot weather. Cucumber isn’t sold in pharmacies but it should be. In Chinese Medicine, cucumber is considered to have heat-dissipating, diuretic, laxative, and detoxifying effects. The first recorded medicinal use of cucumbers was in the 7th century. Its major uses continue today and include: the treatment of excessive thirst, sore throat, laryngitis, acute conjunctivitis, and burns. In most Chinese homes, however, whether eaten raw or cooked as a soup, cucumber is used only for keeping cool in summer, when it is in season, or in early autumn to soothe dry lips and throat. Because cucumbers have natural cooling properties according to Chinese Medicine food theory, they shouldn’t be eaten during the cold winter months. During the winter we need foods with warming properties. The cooling properties of cucumbers also make it a perfect natural detoxifier, so stop throwing money away on detox programs and eat some cucumbers now that it’s summertime. Modern medical researchers found that cucumber is rich in vitamin E, which helps fighting against aging. 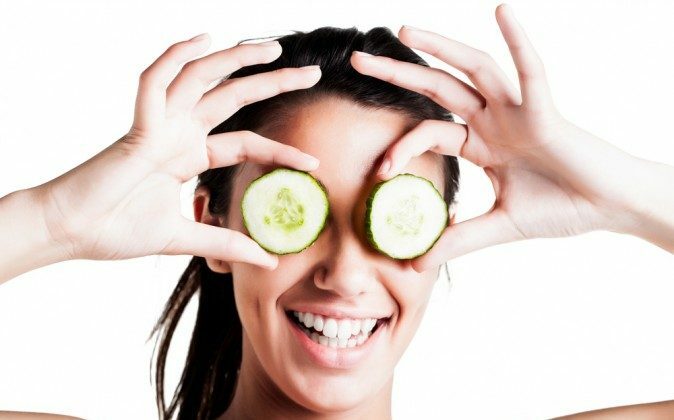 Women like to put cucumber juice or film on the face to smooth skin and reduce wrinkle. Cucumber also contains vitamin B1, which is essential for our brain and nervous system. Chinese Traditional Medicine (TCM) believes cucumber has the ability to soothe the nerves and aid in the treatment of insomnia. This makes perfect sense because we all sleep better when our bodies are cooler and cucumber is one of the coolest vegetables. Studies also show extracts of cucumber seeds and stems may have an effect on high blood pressure. Wow, all this from a little vegetable you can find at every farmers market during the summer months. 2. Feeling tired in the afternoon, put down the caffeinated soda and pick up a cucumber. Cucumbers are a good source of B Vitamins and carbohydrates that can provide that quick pick-me-up that can last for hours. They also keep the body cool during the day which helps eliminate the need for sleep aids at night. 5. Looking for a fast and easy way to remove cellulite before going out or to the pool? Try rubbing a slice or two of cucumbers along your problem area for a few minutes, the phytochemicals in the cucumber cause the collagen in your skin to tighten, firming up the outer layer and reducing the visibility of cellulite. Works great on wrinkles too!! 10. Stressed out and don’t have time for massage, facial or visit to the spa? Cut up an entire cucumber and place it in a boiling pot of water. The chemicals released in the steam creating a soothing, relaxing aroma that has been shown to reduce stress in new mothers and college students during final exams. 13. Using a pen and made a mistake? Take the outside of the cucumber and slowly use it to erase the pen writing. This trick also works great on crayons and markers kids may have used to decorate the walls!! One of the world's favorite superfoods is cucumbers. Baking soda, vinegar, washing soda, a good soap and detergent, and tea tree oil. I find them the safest and most effective for cleaning….everything.